The word angel is derived from the ancient Greek word aggelos which means messenger. The angels are God’s instruments or messengers whom he uses to communicate his will. References to the celestial or non-corporal beings better known as angels, are mentioned more than 100 times in the Old Testament and more than 150 times in the New Testament. From the first book of Genesis to the last book of Revelation, scriptures speak of the existence of angels. In the book of Genesis, the three men who appear to Abraham are angels who have taken human form (Genesis 18:2). An angel of the Lord appeared to Moses (Exodus 3:2) in order to lead the Israelites from captivity in Egypt to the Promised Land. The birth of Jesus was foretold by angels (Luke 2:14). An angel ministered to Jesus when he was tempted in the desert (Matthew 4:11) and an angel comforted him in his Agony in the Garden (Luke 22:43). An angel rolled back the stone at the empty tomb of Jesus (Matthew 28:5) and the Resurrection of Jesus from the dead was announced by an angel. In the book of Acts, God sent an angel to free the Apostle Peter after he was jailed by King Herod (Acts 12:7). Among the angelic beings, the role of the guardian angel is one of great importance. The Church teaches that the special work of the guardian angel is to guide an individual on his journey toward God and to protect him from harm during his earthly pilgrimage. The Church celebrates the feast of the Guardian Angels each year on October 2. Padre Pio had an especially tender love and devotion for his guardian angel. From the time that he was five years old, he was able to see and converse with his guardian angel. In his childlike simplicity, he assumed that everyone had the same experience. Enjoying an intimate friendship with his angel, Padre Pio referred to him as the “companion of my childhood.” The loving relationship continued throughout Padre Pio’s life. For Padre Pio, his angel was his support, his protector, his teacher, his brother, and his friend. At times, Padre Pio’s guardian angel acted as his secretary as well as his heavenly “postman” carrying messages to his spiritual children. When Padre Pio was a newly ordained priest, Father Agostino visited him periodically in Pietrelcina and also corresponded with him through letters. Padre Pio benefitted greatly from Father Agostino’s wise counsel. It became obvious that the demons, who often tormented Padre Pio, were not pleased with the spiritual help that he was receiving from Father Agostino. They made many efforts to interfere. Often, Padre Pio would develop a violent headache when he started to answer one of Father Agostino’s letters. The headache would be accompanied by a severe pain in his right arm which would make it impossible for him to hold a pen in his hand and write. In addition, some of the letters exchanged between Father Agostino and Padre Pio were obviously tampered with. Some were mysteriously marred with ink stains. Padre Pio told Father Agostino about the trouble the demons were causing. He also explained the situation to the parish priest of Pietrelcina, Father Salvatore Pannullo. 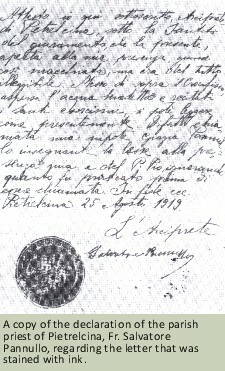 Father Pannullo asked Padre Pio to summon him the next time he received a letter from Father Agostino as he wanted to be present when the letter was opened. Padre Pio did as instructed. 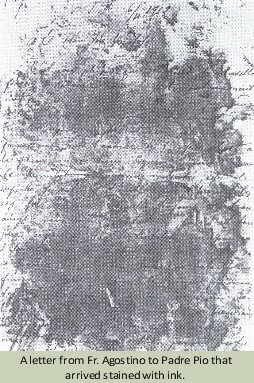 On another occasion, a letter arrived for Padre Pio from Father Agostino which consisted of nothing more than a blank sheet of paper. Padre Pio did not need to ask Father Agostino if he had forgotten to compose a letter. He was perfectly aware that the devil had tampered with it. In order to confound the devil, Father Agostino got in the habit of writing to Padre Pio in French. Padre Pio had never studied French but he was able to read the letters with ease. From time to time he would reply to Father Agostino in French. Father Agostino also wrote to him in Greek and once again, he had no difficulty understanding. Father Pannullo was perplexed about the letters that Padre Pio was receiving from Father Agostino. He knew that Padre Pio had studied neither Greek nor French and asked him how it was possible for him to read the letters. “You know, my guardian angel explains everything to me,” Padre Pio replied. On rare occasions, Padre Pio was also heard conversing in languages he had never studied. On one occasion, Father Agostino asked Padre Pio if Jesus often appeared to him. Padre Pio replied that Jesus frequently appeared to him and spoke to him. Sometimes he appeared with the visible marks of the crucifixion on his body. Padre Pio told Father Agostino that the Blessed Virgin Mary as well as his guardian angel also appeared to him. In 1911, Padre Pio was sent to the Capuchin monastery of Venafro in the province of Isernia. Father Agostino was present in Venafro when Padre Pio went into a state of ecstasy. It was the first time that Father Agostino had ever seen him in a state of ecstatic prayer. He listened closely to the words Padre Pio spoke and realized that he was conversing with his guardian angel. While Father Agostino could see nothing, it was obvious to him that Padre Pio was able to see and communicate with angelic beings. “May your good guardian angel always watch over you; may he be your guide on the rugged path of life. May he always keep you in the grace of Jesus and sustain you with his hands so that you may not stumble on a stone. May he protect you under his wings from all the snares of the world, the devil and the flesh. Padre Pio had a lifelong devotion to St. Michael the Archangel. 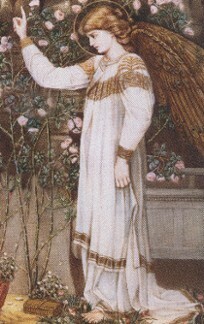 He prayed to the Archangel daily. 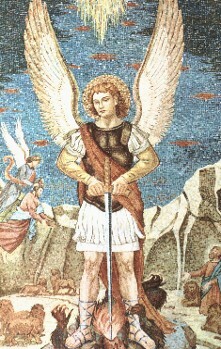 He had experienced the protection of St. Michael many times throughout his life. Every year, he would fast in order to prepare himself for St. Michael’s feast day on September 29. When hearing confessions, Padre Pio frequently asked individuals to recite prayers in honor of St. Michael as their penance. He often urged people to visit Monte Sant’ Angelo, the ancient shrine dedicated to St. Michael. It is one of the few sanctuaries in the world that is dedicated to an angel. Among the many pilgrims that have traveled to the shrine of St. Michael the Archangel, there have been eight popes as well as many canonized saints including St. Francis of Assisi, St. Bernard of Clairvaux, St. Gerard Majella, St. Bridget of Sweden, St. Thomas Aquinas and more. Emperors, kings, and princes through the centuries have also knelt in prayer at the holy grotto. It is indeed providential that the shrine of St. Michael is located on Mount Gargano, just a short distance from San Giovanni Rotondo. In the summer of 1917, as a young priest, Padre Pio went on pilgrimage to St. Michael’s shrine accompanied by a number of Capuchin students. A cart and horse were provided by the father of one of the students. Padre Pio walked for part of the journey and also rode in the cart. The Capuchins prayed the Rosary and sang hymns to the Blessed Mother on the way. Upon arriving at the shrine, Padre Pio remained for a long time in prayer, kneeling at the foot of St. Michael’s altar. Raffaelina Cerase, a spiritual daughter of Padre Pio, once learned an important lesson regarding Padre Pio’s trust in the holy angels. Raffaelina was a Third Order Franciscan who lived in the town of Foggia. When she wrote to Padre Pio, she sometimes included Mass offerings. Because she wanted to make sure that the letters arrived safely, she sent them by registered mail. Padre Pio felt that sending the letters in such a fashion showed a lack of trust and a lack of faith. He said to Raffaelina, “I think it best that you do not send your letters by registered mail. They have been put in very good hands.” The “hands” he was speaking of were the hands of his guardian angel. Father Alessio Parente was assigned to be the sacristan at Our Lady of Grace monastery from 1959 -1961. From 1965 -1968, he served as Padre Pio’s personal assistant. Padre Pio was very appreciative of all that Father Alessio did to help him. He told one of his spiritual children that Father Alessio took care of him with great solicitude, like a “faithful puppy dog.” Father Alessio was filled with joy when he learned what Padre Pio had said about him and treasured the words for the rest of his life. One morning at the conclusion of the Mass, Father Alessio had a very unusual experience. He had just distributed Holy Communion at the altar rail and had taken the empty ciborium back to the altar to purify it. Father Alessio poured water in the ciborium to wash it and then dried it with a purificator. He was just about to put the lid on the ciborium when, out of the corner of his eye, he became aware of something moving. From his right side, he saw a host float down from mid-air into the ciborium. He instinctively looked around to see if someone was there beside him, but no one was. He was shocked by what he had witnessed and told Padre Pio about the incident. Padre Pio advised him to be more attentive and not to rush when he was distributing Holy Communion. Padre Pio added that an angel had put the consecrated host in Father Alessio’s ciborium so as to keep it from falling on the floor. Father Alessio used to assist Padre Pio when it was time for him to get into bed for the night. Afterward, he would wait in Padre Pio’s cell for Father Pellegrino to come in for the night duty. Lying in bed, Padre Pio would always recite the Rosary. Frequently, Father Alessio heard Padre Pio interrupt the Rosary by saying such things as, “Tell her that I will ask Jesus.” “Tell her that I will pray deeply about it.” “Tell him that I will remember him at my Mass.” It was only later that Father Alessio realized that Padre Pio was carrying on a conversation with the guardian angels of some of his spiritual children. One afternoon, Padre Pio was sitting alone on the veranda, just outside his cell. He was praying the Rosary. Father Alessio felt it would be a good opportunity to go over some of the mail with Padre Pio. Many people wrote to Father Alessio and asked him to relay their individual messages to Padre Pio, seeking his counsel and advice. Father Alessio would always discuss the items with Padre Pio and then write back with Padre Pio’s recommendations. Father Alessio was confused. It was obvious to him that Padre Pio was not busy. He was sitting alone with his Rosary in his hand. He always had his Rosary in hand. Father Alessio remained silent but he continued to think about the irony of Padre Pio’s remark. “There have been many guardian angels here today,” Padre Pio explained to Father Alessio. “They were bringing me messages from my spiritual children. Did you see them?” Father Alessio told Padre Pio that he had never seen a guardian angel in his life. He finally understood why Padre Pio had said that he was busy. He was busy communicating with that celestial world which very few mortals were privileged to glimpse. Father Alessio knew that he was truly blessed to be able to assist Padre Pio on a daily basis. He was also on call through the night, because Padre Pio was often sick and needed help in the night hours. Father Alessio was not able to get sufficient sleep and frequently felt the physical and mental strain of the exhausting schedule. Each morning, Father Alessio helped Padre Pio get ready for Mass. He would also help him up the altar steps and then remove his gloves before the Mass began. Afterward, he would rush to his room in order to catch a short nap. He was always so tired that he would usually fall asleep instantly. He had his alarm set so that he would be back in the church by the end of the Mass in order to help Padre Pio down the stairs of the altar. He would lead Padre Pio through the sacristy and then take him back to his cell. Many times, Father Alessio was sleeping so deeply that he would not hear his alarm go off. At that point, he would hear someone knocking loudly at his door. When he answered the door, there was no one there. Mysteriously, the entire corridor would be empty. He would then realize that he had overslept and rush down to the church. Padre Pio would be invariably giving the final blessing. Father Alessio would be just in time to assist Padre Pio down the altar steps. This same scenario happened every time that Father Alessio’s alarm clock failed to wake him up. Every day, when it was time for Padre Pio to hear confessions, Father Alessio would take Padre Pio’s arm and walk with him to the confessional. Once Padre Pio was situated in the confessional, Father Alessio would rush back to his cell to take a quick nap. Each time his alarm clock failed to wake him up, he would have a most unusual experience. He would hear a distinct voice saying to him, “Alessio, it is time to go to the church!” He would instantly wake up and hurry down to help Padre Pio out of the confessional. Sometimes he was a little late, but Padre Pio would always be there waiting for him. He would never attempt to walk through the crowded corridors by himself. Father Alessio was always there to protect him and to fend off the overly zealous devotees. Some carried scissors with them, and would like nothing more than to cut off a piece of Padre Pio’s habit or cut a bit of his hair for a relic. One day, Father Alessio was sitting by Padre Pio’s side, thinking about his problem with oversleeping. He felt ashamed of himself for being so unreliable. He told Padre Pio that he could not understand why his alarm clock failed to wake him up. “You must buy yourself another alarm clock,” Padre Pio said. “I am not going to continue to send my guardian angel to you each day to wake you up!” It was then that Father Alessio realized for the first time who had been knocking on his door and calling to him in his sleep. On one occasion, Father Alessio heard heavenly music in the monastery of Our Lady of Grace. It sounded like a choir of beautiful voices singing together in perfect harmony. Some of the other Capuchins also heard it. They couldn’t understand where the music was coming from and when they asked Padre Pio for an explanation, he told them that it was the voices of angels, taking souls from purgatory to Paradise. Evidently the Capuchins must have looked incredulous when they heard Padre Pio’s explanation, for he then added, “Why should the music of angels surprise you?” When asked on another occasion if angels were present at the Mass, Padre Pio answered that the whole celestial court was present at every Mass. Father Dominic Meyer was serving at St. Felix Friary in Indiana when he was summoned to San Giovanni Rotondo. He served at Our Lady of Grace monastery from 1947 to 1953. He translated for the German and English visitors when they were speaking to Padre Pio. He also helped with the large volume of mail that came into the monastery and answered many of the letters of the German and English pilgrims. Although Father Dominic was initially skeptical about guardian angels, little by little Padre Pio taught him about the reality of the angelic realm. On one occasion, Father Dominic noticed that Padre Pio looked extremely tired. Padre Pio had an explanation for his fatigue. He told Father Dominic that the guardian angels had kept him up almost all night. Through contact with Padre Pio, Father Dominic eventually grew to have a strong belief in angels. When Padre Pio died on September 23, 1968, several pilgrims who were in San Giovanni Rotondo reported to the Capuchins that they saw angels in the night sky. At the time of the sun’s rising, the angels disappeared just as mysteriously as they had come. Knowing Padre Pio’s lifelong devotion to the angels, one can hardly be surprised. Rosina Pannullo was a relative of the parish priest of Pietrelcina, Father Salvatore Pannullo. Padre Pio told Father Pannullo about the incident with Rosina. “Rosina did not tell me what she planned to take from my room,” Padre Pio said. “However, I know that she was going to try to take my breviary.” When Father Pannullo questioned Rosina about it, she admitted that it was true. After speaking to Padre Pio, she decided not to carry out her plan. Rosina’s father, Alfonso, also hoped to verify for himself whether Padre Pio truly had the remarkable intuition that people often spoke about. He decided to test Padre Pio’s abilities. On one occasion, Alfonso, had the audacity to say to Padre Pio, “I am going to enter your home and take something out of it.” “That would not be a good idea!” Padre Pio replied. “Perhaps something would happen to you and you would not be able to carry out your plan.” Alfonso paid no attention to the warning. Margharita Cassano, who lived in the town of Bari, visited San Giovanni Rotondo for the first time in 1948. She was very depressed because of the recent death of her father. Attending Padre Pio’s Mass and making her confession to him lifted her out of her sadness. She decided to move to San Giovanni Rotondo permanently. She told Padre Pio about her decision but he made no reply. Margharita had a very difficult time finding a place to live and finally had to settle for a tiny one room hut in the countryside. It was an isolated dwelling and had neither electricity nor running water. There was not a single neighbor nearby. Even though it was a far cry from what she had hoped for, she was grateful at least to have a roof over her head. To Margharita’s way of thinking, most of the people who moved to San Giovanni Rotondo seemed to have a much easier time than she did of finding accommodations and making ends meet. It hardly seemed fair. One day, without warning, Padre Pio suddenly said to her, “Well, did you come here for the good of your soul or to set yourself up in a comfortable life?” Margharita knew then that she needed to correct her attitude. Margharita rose at 4:00 a.m. each morning in order to walk to the church of Our Lady of Grace to attend the morning Mass. In the winter time, the harsh winds and cold temperatures made the walking very difficult. In addition, making her way alone in the pitch darkness filled her with fear. Margharita still had many challenges to face. Due to her uneasiness at living in such an isolated place, it was usually hard for her to get to sleep at night. One night she prayed to Padre Pio to take away her fear. The next morning when she woke up, she found a beautiful German Shepherd dog sitting on her front porch. When she started out for Mass that morning, the dog walked on the path just in front of her, as if leading the way. To her great surprise, when Mass was over, he walked home with her. That night he slept on her doorstep. He seemed to have made himself perfectly at home and his presence took away Margharita’s anxieties. She could sleep soundly from then on, with no fear at all. 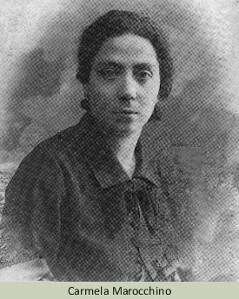 Assunta Lops grew up in San Giovanni Rotondo. When she was fifteen years old she joined several other ladies who had a small store in town and with them, she began to sew the woolen half-gloves that Padre Pio wore to cover his stigmata. In 1955, Cecil Humphrey-Smith of England, who was working as a chemist for the Heinz Company, was sent to the Po Valley in northern Italy where he did quality control work with the tomato crops in the area. Because Cecil had to work very long hours, he did not get sufficient sleep. One night, on the way home from work, he fell asleep at the wheel and had a terrible car accident. He was taken to the Municipal Hospital in Piacenza with a fractured skull, a broken vertebrae in his neck, and other broken bones. The next day, Cecil’s good friend, the Marquis Bernardo Patrizi, came to visit him in the hospital. Bernardo, who was a good friend of Padre Pio, sent his guardian angel to Padre Pio to tell him that Cecil was involved in a very serious car accident and needed prayer. Evidently, Bernardo did the right thing because the next time Bernardo went to San Giovanni Rotondo, Padre Pio confirmed that he had received the message. Cecil soon returned to his wife and family in England but his health steadily declined. He had several bad falls which caused him further problems. He suffered from dizziness, fainting spells, and debilitating and agonizing headaches which made him ill and barely able to function. The headaches were like “red hot claws of steel” that moved from the top of his spine to his head with a terrible intensity. In order to bring Cecil relief, the doctor prescribed heavy pain killers which he soon became dependant on. Seven years after Cecil’s car accident, Bernardo traveled to Canterbury, England to pay him a visit. When he saw the pitiful condition Cecil was in, Bernardo invited him to accompany him to Italy so that he could be examined by several doctors there. Cecil accepted Bernardo’s invitation. He saw several excellent doctors in Italy but to no avail. While in Italy, Bernardo took Cecil to San Giovanni Rotondo to meet Padre Pio. On the day they arrived in San Giovanni Rotondo, Cecil was weak and ill. In the sacristy of the church of Our Lady of Grace, along with a number of other men, they waited for Padre Pio. When Padre Pio came into the sacristy, Bernardo told Cecil to kneel down and to kiss Padre Pio’s hand. Bernardo introduced Padre Pio to Cecil by saying, “This is my good friend, Cecil. He is an Englishman. He was just ignorant enough to crash his car into a wall!” Padre Pio looked at Cecil and then tapped him on his head three times. He struck his head forcefully, right on the spot where the agonizing pain was localized. At Padre Pio’s touch, the pain vanished. From that moment onward, Cecil never suffered from another pain in his head. Seven years of intense suffering, was gone in an instant. When Bernardo telephoned Cecil’s wife Alice in Canterbury and explained to her that Cecil had been healed, she was incredulous. She could hardly believe it. Bernardo spoke to Padre Pio and said, “From the time you touched Cecil on the head and blessed him, he has been relieved of his terrible headaches. Cecil’s wife Alice cannot really grasp the fact that he has been healed. If you would be willing to send her a telegram, I think she would believe that Cecil is fine now.” Padre Pio agreed to send a telegram. Bernardo was one of the trustees of the funds for the Home for the Relief of Suffering. It was Bernardo who brought Barbara Ward to San Giovanni Rotondo to meet Padre Pio. Through Barbara’s efforts, the hospital received the financial help it needed so that the construction work could be completed. Bernardo and other collaborators of the hospital often gathered together with Padre Pio in the evenings to discuss important matters regarding the Home for the Relief of Suffering. Bernardo started taking Cecil with him to the informal gatherings. Cecil noticed that during the discussions regarding the hospital, while Padre Pio listened with attention to whatever was being said, he also prayed. It was the same when he was having a conversation with someone. Cecil became aware of the fact that Padre Pio prayed constantly. No matter what else he might be doing, he was able to keep his mind recollected in prayer. Cecil began to travel once or twice a year to San Giovanni Rotondo in order to see Padre Pio. Once, when Cecil and Bernardo were talking to Padre Pio in his cell, Padre Pio took Cecil’s hand in his own and held it all through the conversation. Padre Pio seemed to love their visits. On one occasion, Padre Pio asked Cecil if he loved his mother. “Of course I love my dear mother,” Cecil answered. “Doesn’t everybody?” Cecil thought it was an odd question to be asked. Padre Pio asked him the same question on many occasions. Finally, it dawned on Cecil that Padre Pio was speaking, not of his earthly mother, but of his heavenly mother, the Madonna. Through his friendship with Padre Pio, Cecil learned a lot about the angels. 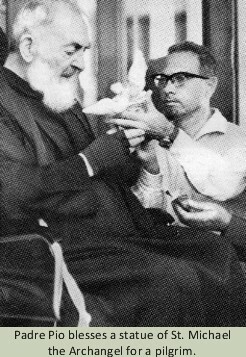 Once when Cecil was getting ready to leave the monastery, as he said goodbye to Padre Pio, he told him that he would write to him soon. “Son,” Padre Pio said, “I have more letters than I can read. I am not able to keep up with my mail. Send your guardian angel to me instead.” From that time forward, whenever Cecil needed Padre Pio’s counsel, he sent his guardian angel to him with the message. Once, a married couple had a young daughter who was very ill. She had a persistent high fever, and although measures were taken to reduce it, the fever would not break. The mother decided to send her guardian angel to Padre Pio, asking for his prayerful intercession. Almost immediately, there was a reduction in the fever. Right after that, the girl drifted off into a deep and peaceful sleep. When the woman told her husband what had happened, he told her that he too had been praying to his guardian angel, asking his angel to deliver a message to Padre Pio requesting prayer for their daughter. One evening, Capuchin Brother Bill Martin was standing with Padre Pio at his cell window. Many people had gathered below Padre Pio’s window and were waving goodnight to him. Padre Pio gave his priestly blessing to the crowd just like he did every evening. After the blessing, Brother Bill noticed that Padre Pio became very still. He seemed to be staring intently at something in his cell. Brother Bill looked in the direction that Padre Pio was staring, but there was nothing there. Padre Pio also appeared to be listening with attention to something that was being said to him. Brother Bill could hear nothing. Finally, Padre Pio said to Brother Bill, “Where is Martha Gemsch tonight?” Martha Gemsch was one of Padre Pio’s spiritual daughters who always joined the other pilgrims each evening in bidding Padre Pio goodnight. Bill did not know the whereabouts of Martha. The next time Brother Bill saw Martha, he told her that Padre Pio had asked about her. Martha explained to Bill that she had taken a trip to Rome. While in Rome, she thought about Padre Pio and the blessing that he gave each night at his window. Since she could not be there, she sent her guardian angel in her place. Martha confirmed what Brother Bill had suspected all along. Padre Pio had been talking to Martha’s guardian angel. On one occasion, Carmela felt deeply concerned about a particular problem in her life. She wanted to send her guardian angel to Padre Pio with a request for assistance but it was quite late at night. She didn’t want to disturb Padre Pio at such a late hour so she decided against it. The next time she saw Padre Pio she explained why she had not sent her angel. He told her that she could indeed send her angel to him at any time of the day or night. He was always happy to receive the message. That God whom we desire to see and hold before us, is always ready to come to our assistance. Always faithful to his promises and seeing us fighting valiantly, he will send us his angels to sustain us in the trial.